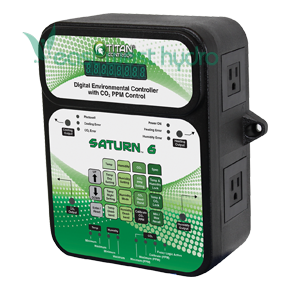 The Saturn™ 6 give you the control of your temperature (day & night), humidity and CO2 PPM levels with digital accuracy. It comes with a 15 foot remote sensor which also features a photocell. The photocell ensures daytime only CO2 enrichment and the ability to control a ‘night only’ device. 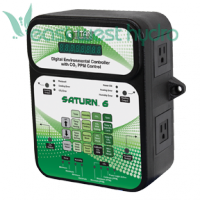 The LCD display and push buttons allow you to easily change the settings. It has min/max data logging capabilities. Plastic enclosure protects internal components from dust, rust and moisture. 15 Amps/120 Volts/60 Hz. 3 year warranty.